Heading north out of Tellico Plains on TN 68 take a left onto TN 39 AKA Mecca Pike at .5 mile. Stay westerly on TN 39, a rather typical two-lane back road, for 3.75 miles. Then turn left onto TN 315 south. TN 315 begins with gentle curves through scenic bucolic farm lands with mountain ridges visible in the distance. At 2.25 miles into 315 you’ll enter the Cherokee National Forest and State Wildlife Management Area. Much of the roadside properties are privately owned with the Forest areas on the back roads. Here the twisties and local sights begin to get interesting. There are some serious drop-offs if you get off-road and the vacant singlewides and old farmsteads make one wonder what happened to the owners. Along the way is a marker for Maggies Mill Historic Site. The Maggies Mill love story is actually not very historic or even true. It seems that a poem about Maggie was written in 1864 and set to music the following year with the title When You and I Were Young Maggie has been erroneously connected to Maggies Mill in Tennessee. The author was a Canadian and never set foot near Tennessee to woo Maggie. The memorial plaque placed there by the Ocoee Chapter of the D.A.R. in 1930 is entirely in error. As you near the southern terminus of TN 315 you’ll find Childers Creek Road near Reliance. Just a hop to the east on Childers is the old Higdon Hotel. With the railroad coming to the area in the late 1880s Calvin Higdon built his hotel at what the railroad would eventually name Higdon’s Station even though the Post Office was named Reliance. The structure, which operated from 1890 to 1920, is on the National Register of Historic Places. In 1993 there was some talk of renovating the hotel, but as of today it remains as it was when it closed. At the eastern end of Childers Creek Road (5 miles from 315) is the Hiawassee Power House and Footbridge. There are a number of scenic photo places along the Hiawassee River. Back on TN 315 you’ll cross the Hiawassee and find the Reliance Post Office, Texaco Gas Station, fishing supplies, raft/duckie/tube rental, shuttle service, ice, rest rooms and campfire wood all in the Webb Bros. Reliance One-Stop Store. They were closed when we stopped by mid-afternoon on Friday. Don’t know if they are still in business or not. From Reliance take TN 30 south. These next 9 miles have some great twisties. Some of the most severe turns have hash marks painted on the side of the road as a warning. There are more vacant homes along here, with the most interesting one that we called the House in the Hole. We took a little side track 2.5 miles west on US 64 to drive up the Oswald Dome Road. Here just 2.3 miles up is an overlook with an inspiring view of Parksville Lake and Marina, Sugarloaf Mountain and the Cherokee National Forest. Back on US 64 heading east there are many pull offs to take a break and see the lake. Watch out for traffic on US 64. There are logging trucks and 18 wheelers too. The serious curves are well marked and have guard rails. This is no place to go down. The Ocoee Whitewater Center is 10.2 miles east of TN 315. This was the location of the 1996 Olympic White Water competition. There are a number of outdoor attractions available along the Ocoee River. White water rafting is one of the more adventurous activities and is only open on certain dates. Also popular are the zip lines and canopy tours. Other water attractions include canoe, rafting and tubing. Or just plan a picnic by the lake/river. Many Forest Service roads are here to explore. We will be covering more of this in the coming year. We’re equipping our Jeep Wrangler for some major back woods explorations. US 64 passes through Ducktown. The entire area was strip mined in the 1950-60s and I recall the terrain looking much like the surface of the moon. The land has been mostly reclaimed and there are only a few places where you can see the destruction of the past. Visit the Ducktown Basin Museum to see much about this interesting copper mining history. 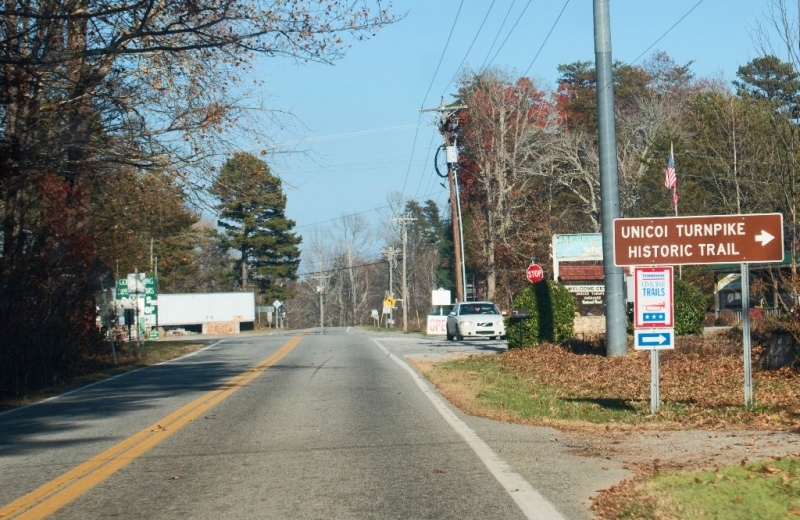 Just 3.5 miles south on TN 68 are the quaint towns of Copper Hill, TN and McCaysville, GA. There are several restaurants to choose from and the TN/GA State Line runs right through one of them. Or stand on the corner with a foot in each state. The Loop follows TN 68 north from Ducktown. Here again we encounter the typical country two lane highway passing through Dogtown, Stansbury Siding, Harbuck and my favorite, Turtletown. At 9.8 miles north of Ducktown TN 123 branches off to the east and crosses into North Carolina. On the corner is a quaint old service station that is for sale. It even has a lift in the detached garage. Back on TN 68 heading north you pass through Pine Ridge, Farner and Appalachia. The highway then makes a dramatic descent of 450 feet in less than a mile to the Hiawassee River passing under the trestle used by the Tennessee Valley Railroad. You can actually take the 50 mile train ride by boarding at the Etowah depot. One of the highlights is the complete loop around Bald Mountain that was built to gain elevation (link). After crossing the river the road then quickly climbs back up 650 feet in elevation. The pavement is good with easy sweeping corners in densely forested terrain. The Benton MacKaye Trail crosses TN 68 as it rambles from Georgia to the Great Smoky Mountains. TN 68 then returns to a more rural two lane highway with scattered residences and farm land. Watch out for a couple sharp corners here and there. At Coker Creek there is a small visitors center. Gold was found here before the California Gold Rush and nearby is the local Coker Creek Chapter of the Gold Prospectors Association of America. The old Unicoi Trail, an early American road used to cross the rugged mountains, leads eastward from here into North Carolina. It is mostly gravel. Back at Tellico Plains enjoy a freshly made sandwich at Tellico Kats located just east of town on the Cherohala Skyway. They have great sandwiches on the scenic riverfront deck.